Following the applause that greeted their St Rose café in Melbourne’s Essendon, Domenic and Diana Caruso cast their eye a little farther afield, setting eventually on a spot in Ascot Vale. Local design studio Biasol was tapped to work on the interiors and branding of No 19, taking as its inspiration the Melbourne delicatessens of the 1950s. 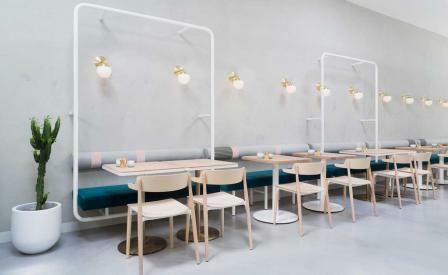 The concrete central counter, walls and floor are offset by white modular railing and brass capped globe lamps, alongside customised timber-topped tables, plush blue banquettes and modular Pedrali chairs. The semi-open kitchen is flanked by high stools, providing an ideal perch on which to survey the vegetarian and gluten-free heavy menu – this starts with a breakfast of spelt bircher, chia seed banana bread, and acai bowl before seguing into a lunch salad of kale, halloumi and sumac hummus and, if you’re feeling particularly carnivorous, a wagyu burger layered with smoked cheddar and red onions.